You have just finished setting up your campsite. Everything is in place, and you are now feeling so tired. What you need now is a drink. It could be a hot cup of coffee or any delicious beverage. Whatever beverage you want to drink while camping, having the high-quality camping mug can add to your camping experience. There are several camping mugs available in the market to choose from. To save you from the complicated process of going over hundreds of camping mug brands to get the best camping mug, we have narrowed down everything for you. After thorough research and testing, we have come up with a list of six best camping mugs that you can choose from. Whether you are a camper that is looking for a big camping mug or you are a backpacker looking for the lightest option, we have got you covered. Take a look at the products we have reviewed below and take your pick. To ensure that you get the best mug for your camping, always consider the material used to make it. Different manufacturers use different materials in making camping mugs. Some are made of good and durable materials while others are made of light materials. This gives you a chance to choose the material you prefer for your camping mug. Commonly used materials for making camping mugs include silicon, aluminum, enamel coated metal and stainless steel. You should, therefore, make a good choice when buying a camping mug from the variety in the market. Camping mugs have inbuilt insulation to make sure they store your beverages cold or hot. This is of benefit to you since you can get your beverage in the temperature you would like. This is why before you buy a camping mug; you should take an interest in understanding its insulation ability. Understanding the insulation ability of a mug will ensure that you buy a camping mug that insulates well. Depending on your type of camping, the size and weight of a camping mug should be considered. For instance, when going for hiking or for a backpacking trip, the size and weight are very important. This is because in this case, you need not carry something heavy and that will add your fatigue, and you end up not enjoying your excursion. When buying a camping mug, always consider the space you have for the mug and how you will carry it when you are out there for your adventure. With this in mind, you will definitely know the right size and weight you will need for your camping mug. Having a lid on your camping mug makes it better! Some people can’t imagine having a lid while others can’t imagine going out for an adventure without a lid. When buying a camping mug with a lid, you should be very careful on the camping mug you settle on buying. This is because if the lid of a camping mug is not well fixed and designed, it can be the worst offender. Always be keen on checking the reviews to try and determine the best camping mug on the market before buying. Whether you are going for a backcountry camping or just car camping, the basics are the same. Over the years of camping, some things have made the cut as must-haves for campers. One of such things is camping mugs. 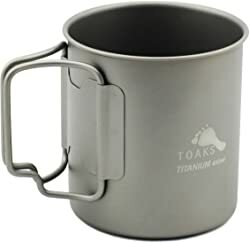 To have the best camping experience, you need to have the best camping mug, and that is why we recommend TOAKS Titanium Cup for you. TOAKS Titanium Cup has several features that make it our number one pick. First of all, what we liked about it is that it is a utilitarian lightweight cup. This will enable you to cut weight in your backpacking setup and use it with a lot of ease. It also has a construction that seems to be well thought out. It has handles that are held on using a single wide strip of titanium. You can, therefore, hold the cup easily over a flame. TOAKS Titanium Cup is also able to perform all the vital functions that you might expect from a cup. Apart from holding liquid foods, you can also use this cup to boil water for a meal. This is because you can stack it on most canister stoves. It is a great cup for the price. Can make a great coffee cup. Made of grade 1 titanium with no coating hence it won’t produce any nasty taste or toxins. You can use it to heat water without any dents or signs of heat damage being left on it. While you are out there camping, you might want to start your day with a hot cup of coffee. To enjoy your coffee, you will need to keep it warm for long by using an insulated mug. 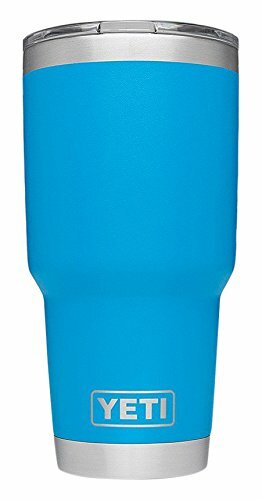 YETI Rambler Steel Vacuum Tumbler is, therefore, the best-insulated camping mug for you. This cup has several fantastic features that make it the best-insulated camping mug. It has a double wall vacuum insulation that will keep your hot drinks hot and cold drinks cold until the last sip. You can, therefore, bring your Yeti coolers along for your camping trip so you can use your Yeti tumbler with it. This tumbler is resistant t dings and dents because it is made of a kitchen grade stainless steel material. It’s no sweat design will also make sure that your hands are always kept dry. What’ more, the process of opening and closing this tumbler has been made easy because of the presence of a magnetic lid. Its vibrant colors make it the most fun drink accessory you could ever have on your camping trip. Made with a durable coat of color that will not fade. Has a shatter-resistant lid that will allow you to check the status of your drink in a flash. Resistant to puncture and rust due to the kitchen grade stainless steel. Your hands will always stay dry when you use it due to its no sweat technology. They are engineered to be virtually indestructible. Some customers have complained about fake Yetti tumblers. You should, therefore, watch out for fake Yetti products. If you find our first pick is out of stock, then you should go for Stanley Classic One Hand Vacuum Mug. This camping mug has several fantastic features that make it our alternative pick. It has a modern design with a classic touch. 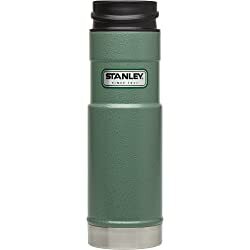 What makes Stanley Vacuum Mug stand out from the rest is its classy vintage-esque green exterior color. Another good thing about Stanley Classic Vacuum Mug is that it is built for life. It has a rugged and durable design that will make it last with you through several camping trips. This camping mug is also designed to keep your coffee hot for up to 9 hours. This is because of its legendary Stanley vacuum insulation. This insulation is also a double wall type. The lid of this Mug breaks down into a few different pieces that are very easy to assemble. The push button on the lid will enable you to open, drink and close your mug using just one hand. It is small enough and very light. It is naturally BPA free. It is leak proof to enable you to pack and travel with confidence. The button can sometimes be stiff. If you are on the lookout for a camping mug and you are on a budget, then GSI Outdoors Infinity Backpacker Mug is the right pick for you. It is one of the cheapest camping mugs available in the market. Although it is a bit cheaper, it has desirable features that make it suitable for use while you are out camping. First of all, what makes GSI Outdoors Backpacker Mug be the right camping mug for you is its size. It can hold approximately 17 ounces of your liquid food. It, therefore, holds more fluid than most camping mugs. GSI Outdoors Backpacker Mug is also very light so that it can fit in your backpack with ease. 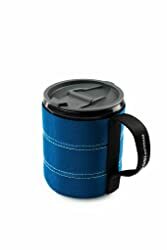 Its lightweight insulated sleeves make it keep your beverage warm for longer periods. The sleeves will also keep your beverage free of dirt. Using this cup is also safe even for hot fluids because it is made of naturally BPA free materials. Its collapsible handles make it easy to pack and store. This mug also has sturdy handles to allow for a steady grip when using it. Another good feature that you will love about GSI Outdoors Mug is its sip-it lid. This lid will help to prevent spills whenever you are drinking from this cup. This GSI Outdoors Mug also has graduated measurements on its side. You can, therefore, use it as a measuring cup. It has a larger capacity as compared to most camping mugs. Made of shatter-resistant polypropylene that is BPA free. It is wide and shallow. You can, therefore, use it as a bowl. Comes with an insulated sleeve that is removable. Drinking from it is easy. The handle may feel flimsy. Are you looking for a coffee mug that is perfect for your camping needs? Then the Enamel Camping Mug is the right choice for you. The best thing about buying this mug is that one set consists of two mugs. These cups have features that make them great for camping. They are strong and lightweight. When you are packing for camping, the last thing you need is carrying a heavy item in your backpack. This is why Enamel Camping Coffee Mug is designed to be lightweight and strong at the same time. The best part is that with these mugs, you are not limited to using them for drinking only. You can also eat out of them. You can use them to drink your favorite soup just before you go for hiking. These two sets of cup also come in awesome designs. To enjoy your beer or coffee while camping, this is the type of camping mug that you should consider having. They also have a superior size as compared to most camping mugs. This makes them perfect for holding enough coffee for that chilly morning at the camp. Enamel Camping Mugs are also perfect as gifts to adventure seekers. This is because they come packaged in a display box. 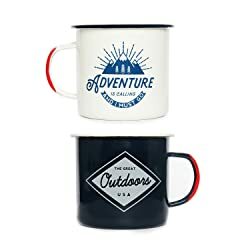 If you have someone who is special in your life, who is an adventure lover, then you can make their camping trip memorable by getting them the Enamel Camping Mug. They are super lightweight and durable. They have an adventure design that makes them perfect for camping. ​Due to its super-size, you can use it for several purposes. These mugs are stain resistant because they are made of enamel. They are perfect mugs for drinking beer too. Can easily break if it falls on a hard surface. If you feel like you have more money to spend on buying a high quality and expensive product, then Valtcan Titanium 750ml Camping Cup should be your perfect choice. If you are also looking for a camping mug that can be used both as a mug and a pot, then this is still your ideal choice. It is made of 100% titanium. This makes it very strong and durable. The best thing about this Valtcan mug is that it is the largest in terms of capacity. It can hold up to about 750 ml of fluid. Finding camping mugs with such large capacities is very rare. It also comes with a lid and a mesh bag. This allows for easy travel and storage. Valtcan Titanium 750ml Camping Cup is also ultra-lightweight. This makes it perfect for camping. Since it is made of titanium, it is totally non-toxic and hypoallergenic. You can, therefore, use it to drink anything without worrying about strange smells or toxics. 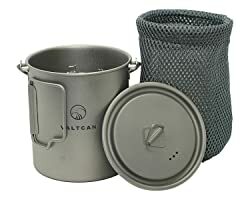 Valtcan Titanium 750ml Camping Cup also comes with base handles that you can use to hang it for cooking. The handle also folds easily to allow for easy storage. The round bottom edges make this camping mug to be easy to clean. Storage is easy because the handles fold away. Leaves no metallic smell or taste since it is made of titanium. You can use it to heat water or any liquid. The bail handle is removable. Has a titanium lid to prevent spilling. It has measurements that are well marked inside. The lid has three little holes at the top to allow for steam to vent. It is a bit expensive as compared to other camping mugs. There you have it on the best camping mugs. Depending on what you are looking for in a camping mug, our review has covered all types of camping mugs from the cheapest mugs to the lightest mugs. You can, therefore, choose the best mug that you feel will add to your camping experience. When it comes to our pick, we would like to recommend TOAKS Titanium 450ml Cup. This is because it is made of titanium hence very durable. It is also reasonably priced as compared to other camping mugs that are made of titanium. That’s not all; it is also possible to use this cup to warm water or warm your coffee. Have you ever used any of the camping mugs that we have reviewed above? If yes, how can you describe how the mug performed when you were camping? Which mug are you considering buying for your next camping spree?